made with Hot Chillies, Garlic, Coriander, Caraway, Cumin Seeds, Paprika, Salt and rapeseed oil. 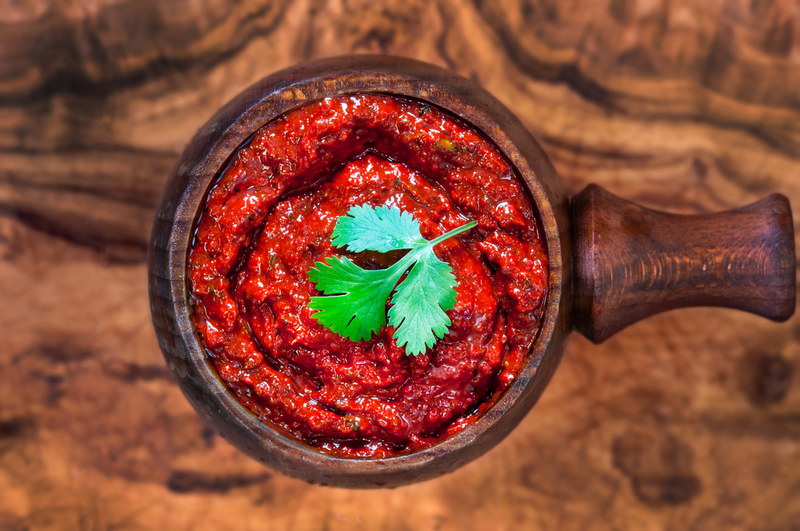 This is a spicy Moroccan marinade which is not for the faint hearted. If you love chilli you know how addicting it can be and this is ideal for adding to soups, sauces, casseroles etc. Although roasted sweet potatoes coated in this harissa is the current favourite. Ground Cumin, Caraway Seeds, Paprika. Basil Pesto made with Basil, Cashew Nuts, Pecorino Cheese, Garlic, Salt , rapeseed oil and lemon juice. Sweet Chilli Paste made with Red Chilli Peppers, Feta Cheese, Garlic, Basil and rapeseed oil. Red Pesto made with Sundried Tomatoes, Basil, Pecorino Cheese, Cashew Nuts, Garlic ,rapeseed oil and lemon juice. Green Tapenade made with Green Olive Paste, Coriander, Lemon Juice, Garlic and rapeseed oil.